A review on Tripadvisor by Organicprof of Baltimore. Many thanks, Organicprof, look foward to seeing you again soon. 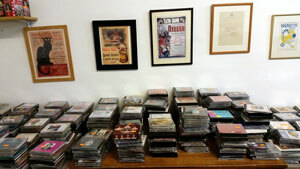 “The shop has a large number of used classical CD's at reasonable prices. You can find works and composers you've never heard of. “But that's only the half of it. The owner is extremely outgoing and will offer you a free cold soft drink, coffee, use of the bathroom. I went there with my music loving husband, and while he was looking through the stacks of CD's, I sat in one of the comfy stuffed chairs while the owner regaled me with stories of how he runs his shop. Everyone who enters is treated like an old friend. A similar experience is related on the Gramex website. While I was in the shop, a customer from two years ago came in; had such fond memories of the owner that he actually brought the owner some unusual opera DVD's. The Guardian, 4th November 2015. Thank you to mole_9 for recommending us. Many thanks to Mark Greville for leaving this review on our Facebook page. Look forward to seeing you again! “Well I went into Gramex and had possibly the most unique and best music shopping experience in my life. Roger the owner and Arie who may have been a friend, another customer, a shop employee told me to take off my coat cause I'd be there for a while. They regaled me with stories galore, offered me tea, argued with each other about opera and then chatted at length to a customer from Scotland about Debussy. “The shop itself is absolutely stacked with classical cds, most of which are unordered so you do need to take your time but the music is in great condition and really affordable. I ended up there for 90 minutes and bought about 10 CDs. I came away with 11 though because as I coudn't decide between 2 versions of Bach's Well Tempered Clavier. Roger 'lent' me one. I either have to return it or pay for it next time im in London. Ah well, I'll have to make another trip in that case! Earlier in April we moved to our new home. We're still in the same shop – we've simply moved downstairs. The move went well, and now we're easing into our new accomodation. 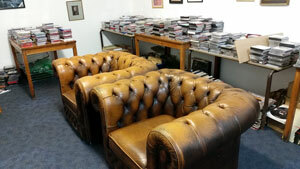 Still a little work to do – but as always we have piles of CDs to entice you, with new stock coming in all the time. We look forward to seeing you soon. And while you visiting, take a look at The Book Warehouse, offering a wide selection of books at discount prices. Entrance to Gramex is at the back of the bookshop and down the stairs. We're moving again - but not very far! In an exciting new development, Gramex is joining forces with The Book Warehouse. We're moving downstairs, and The Book Warehouse are taking up residence above us. Two fabulous shops in one! We look forward to seeing you in our new home. A bargain basement indeed! Gramex: very competitive prices, but the chat is worth more! We've been snooping around the internet, finding out what people are saying about us. And the word is good. Many thanks for the generous comments on slippedisc.com. DLowe says: I’ll second Robert’s suggestion of Gramex, by Waterloo. I was there for two hours yesterday chatting to the owner, Roger, the most knowledgeable opera buff I’ve encountered. Very competitive prices, but the chat is worth more. The only shop I’ve ever been into where I’ve been offered a tea and a bun free of charge. J says: Absolutely! Gramex are going from strength to strength, and a few months ago upgraded their premises, moving to a slightly busier part of the street. Jonathon Higgins says: Delighted to hear Gramex is still going strong! Not been for years as I rarely pass through London, but I have fond memories of the many hours I spent there when it was the best second hand LP shop in London! Many thanks to David Patrick Stearns for the following article about Gramex. Proceeding on to Gramex, I discovered it had recently moved, though only across the street. The new quarters looked a bit raw. Nothing up on the walls. Just a lot of card tables with lots of CDs stacked on them. The proprietor Roger Hewland had conked out on an easy chair so decisively (and was sleeping so quietly) I feared that he had been there for a few days and wondered what was London's version of 911. His fresh-starched shirt assured me he was alive and had been sleeping only a matter of minutes. I began looking through the stacks and seeing lots of things I would be jumping for joy to find – had I not already owned them. Lots of good re-masterings of live Metropolitan Opera radio broadcasts. Some Testament-label things that never turn up in collector shops. The proprietor woke up. and directed me to a table of new arrivals, claiming that they were particularly interesting. And he was seriously right. Before long I	had a formidable stack and he heartily approved of everything. A live Queen of Spades recording with Sena Jurinac. Peter Maxwell Davies concertos for instruments so diverse you had to hear how he did it. “I might already have this,” I said. Damian Thompson, 29th May 2014, The Telegraph. Here's a story that I mentioned in my newspaper column on Saturday but haven't put online. So let me remedy that right away. I’ve often sung the praises of Gramex, the world’s best second-hand classical LP and CD shop, where the mischievous and chatty octogenarian Roger Hewland – an Old Labour Italian opera fanatic, if you can imagine such a thing – has been holding court for decades. Tea, biscuits, armchairs, artfully disarranged vintage recordings: bliss. The YouTube video above, filmed in 2011, gives you a pretty good idea of the atmosphere. Here's an article I wrote about Gramex in the Spectator. Recently, though, we Gramex faithful have been worried. Roger’s shop in Lower Marsh, just behind Waterloo Station, is due for demolition. I was going to ask readers if they knew of empty premises, but I was advised that any hint of problems would attract sharks. So the search for a new shop had to happen under the radar. And Roger has pulled it off. Gramex is now in larger, brighter premises on the other side of the same road. Phew! There’s new stock, but the armchairs are the same, and the portrait of Oliver Cromwell is back on the wall. Certain well-worn anecdotes have reappeared too, but believe me, we’re not complaining. We have moved to our new shop at 104 Lower Marsh, across the road from our old shop. See our map for full details. Many thanks to Damian for his kind words. Many thanks to Brian Micklethwait for mentioning us on his blog. Gramex boss [Roger Hewland] prices his stuff with more than half an eye to what Amazon charges, and it remains worthwhile to visit Gramex from time to time, even as all the other central London second hand CD emporia have faded away. He piles them high and sells them cheap. Many thanks to Pianomania for the kind article on their blog. With the Compact Disc being gradually replaced by downloadable digital media, the traditional bricks and mortar CD shop is dying a sure and lingering death (for collectors, that is). That explains why there are no decent CD shops for classical music in Singapore. The once great HMV has become reduced to a pitiful half a shelf stocking things by Il Divo, Susan Boyle and André Rieu (yecch!). Even London's HMV in Oxford Street has become a pale shadow of itself. …which is why a shop like GRAMEX is heaven-sent for collectors of classical CDs. In existence in London for over a century, it is purportedly the oldest surviving independent record shop in the world. Gramex deals mostly with second hand CDs, many obtained from collections, but there are some new CDs still in their shrink package, but half of the usual retail price. Gramex is located at 104 Lower Marsh, just behind Waterloo Railway Station, and has been their for almost the last half-century, although the shop space has moved occasionally within the same street. It is owned by septuagenarian Roger Hewland, who has been its custodian since 1980. According to him, he had sold over 2 million recordings (LPs and CDs) over the last 34 years! I first stumbled upon this Aladdin's cave of musical treasures in 2002, when idling around the South Bank in between sessions of the London International Piano Competition (a proud institution now sadly retired). What a wealth of recordings it had, including many deleted items price from 1-8 pounds a piece. This is since been a must-visit place for me during every trip to London. One needs to spend at least an hour or two to rummage through the piles of CD spread over many tables and shelves. The items are arranged in no particular order, which makes the discovery of certain items a pleasant surprise, especially when you thought that item had been deleted a long while ago, and had given up hope of ever finding it! Prices range from 4-8 pounds per disc these days, but it is still a bargain. Mr Hewland makes you welcome at every opportunity, even if you do not intend to buy (which is never the case here). He offers you coffee or tea, as you make life-changing decisions of adding to your own collection. Credit cards are accepted, and then he gives you a whopping 15-20% discount on all your purchases. All CDs are guaranteed for 2 years, and you can return if not satisfied! Imagine how it made my day when I got the London Symphony Orchestra set of Mahler's symphonies conducted by Valery Gergiev at just 24 pounds! “A simply delightful shop for classical connoisseur or newcomer alike; the two owners have an encyclopaedic knowledge of repertoire and recordings and listening to them debate the relative merits of opera singers is like hearing a pair of Radio 3 presenters in full flow. “A veritable mecca for lovers of 78s, LPs, and CDs--all used, of course, with a staff knowledgeable and most helpful. In 1999, I wandered in on a summer afternoon and came away with rare 78s by Adelina Patti. Now CDs have taken over most of the space, and I always find desirable classical disks to add to my collection. Proprietor Roger is a walking encyclopaedia of information about operatic recordings of artists from both past and present---no matter how "rare and rotten." His colleague John is equally helpful with both classical and jazz recordings.